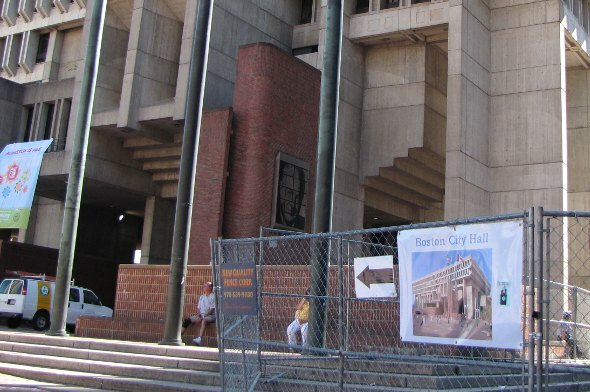 The only reason City Hall is the most hated building in Boston is because most people somehow manage to completely ignore the Government Service Center on Cambridge Street between Staniford and New Chardon. 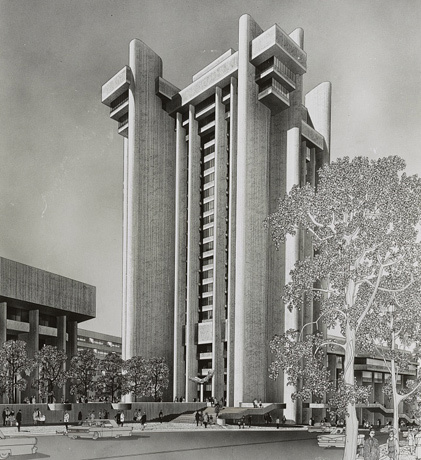 But the building, which houses various government offices, such as the Lindemann Mental Health Center, would have been harder to ignore under architect Paul Rudolph's original plans, which called for a 23-story tower. Read more. Just noticed the weird lights atop the new high-rise at the Pru last night. I know the late Mayor Menino always championed unique designs like the "crown" n the nearby Huntington Avenue building, so is this part of his legacy, too? Either way, I think I kinda like it. What's not to love? 2012 photo. ArchDaily interviews a trio of architects writing a book about the glory of 1960s and 1970s concrete architecture in Boston and why they prefer to call it "Heroic" rather than "Brutalist." For starters, not all concrete buildings are brutalist. Equally important, they say, all that concrete reflects an era in which city leaders managed to revitalize a city that had been somnolently declining for decades. Read more. Both are examples of sawtooth design, which, at least in the case of Millennium Place, allows for more profit-maximizing "corner" units. Utile explains. Imagine City Hall or the Hynes covered in vines. If Nate Swain has his way, it could happen. For the past couple of years, he's been covering eyesores in the North End with vinyl canvases covered with high-resolution photos. See if you can spot his work in the photo above. His first project was in a building facing Salem and Prince streets in 2009. He photographed and then printed scenes such as a cat on a windowsill with flowers in pots; a goldfish swimming in a bowl, printed them onto a mesh vinyl back, then installed them over the windows. The idea is to create a sort of an "idyllic" concept, as he calls it. Ever want to ask the architects of Government Center what in the world they were thinking? It will begin at the Lindemann Center in Government Center, and will include a broad range of works showcasing the variety and quality of modernism in Government Center. Aug. 17, 5:30 to 7 p.m., free to alliance members and $15 for everybody else. Reservations required: [email protected] or 617-367-2458. Against the philistinism of a bunch of tourists, there comes a City Hall defender. A lot the tourists know. Without City Hall, there'd be none of the "more aesthetically pleasing ameneties" nearby, like Faneuil Hall. Some interesting photos: See how downtown has changed - and hasn't. My pick for the ugliest building in Boston. The state Department of Mental Health's Hurley Building was designed in the same "brutalist" mode as the nearby City Hall. But City Hall is a delightful little confectionary compared to this truly brutal, depressing series of concrete fists smashing the spirit of onlookers into a thin pulp. Elephantine concrete columns follow one after another, with no visual relief, figuratively pounding you in the head without stop. Dynamite would be too kind for this monstrosity, which would be far better suited as the headquarters of the KGB circa 1965 than a building in the cradle of American liberty. It's especially depressing given its location across the street from the classic West Church and, for that matter, all of Beacon Hill. MFA background info on the expansion.